Built from parts you can see and easily swap; designed to move signals you can easily measure and hear with simple instruments; vintage analog radios are fun to explore. 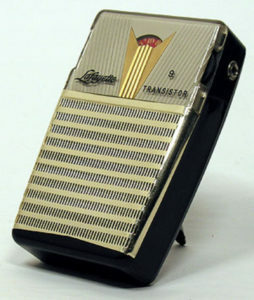 You can, even with no prior electronics background, using the techniques found on this site, get many old transistor radios playing. You can often make them look like new again too. You’ll learn a lot and gain a great deal of satisfaction in the process. Much of the content here started out as the draft of a book I intended to sell to collectors. Part-way in I decided to give the content away for free on the Internet instead, so that more folks could read it and contribute to our collective knowledge base. While created with beginners and intermediate hobbyists in mind, even more advanced techs will undoubtedly find numerous useful ideas, shortcuts, and technical resources as well. We hope you experienced folks will add your tips and ideas here as well. Starting with an illustrated introduction to useful workbench features, supplies and tools, you’ll read about a basic “no frills” workspace and more advanced workshop configurations. There are some important safety tips included as well. You’ll see how to avoid needless damage while you clean and polish cases, fix plastic cracks, replace plastic chunks, restore lettering, electroplate metal surfaces, renew imitation “plastic chrome”, and repair cardboard boxes. See how to quickly fix completely dead radios, weak players, “scratchy” volume controls and intermittent sets. Read about the ten common faults responsible for as many as half of today’s non-playing radios. Get them working again, perhaps without ever warming up a soldering iron or turning on any test equipment. See how to identify, test and replace components, including transistors, capacitors, resistors, coils and other components. Understand schematics, color codes, date codes and other technical documentation. Read about how to shop for affordable test equipment including multimeters, signal tracers, signal generators, power supplies and other pieces of useful, new or vintage test gear. Learn how to make time and money-saving homebrew tools, cables and test gear. Read important tips and techniques for safely soldering and desoldering without damaging fragile, miniature radios or yourself. Gain confidence using test equipment to inject and trace signals to help isolate faults. Learn when, how, and when not to align radios. Perhaps we will all make some new friends and share our knowledge and experiences as well. I hope so. BTW: This site was once called childhoodradios.com (plural). After I retired that old URL some folks purchased it for their Lean Belly site. Since the Internet seems to never forget, there are a number of old radio collector site links out there meant to point here. If you spot them, please tell the link owner about the change and/or let me know in the comments section. Thanks!